What Are The Best Travel Electric Toothbrushes? We all know how important oral hygiene is. A dazzling smile and fresh breath are two things you should never leave the house without. Nowadays, most people prefer the super sonic clean of an electric toothbrush. However, with bulky charging units, electric toothbrushes aren’t always the most travel-friendly options. 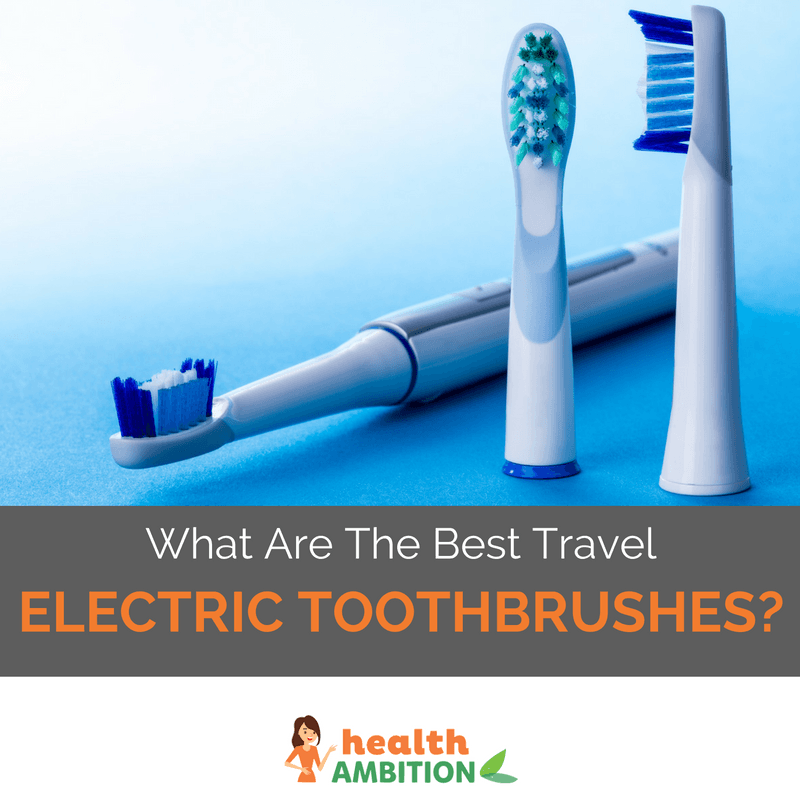 In this article I’m going to take a look at the products available and see what are the best travel electric toothbrushes. Who Needs a Travel Electric Toothbrush? If you’re someone who travels regularly, whether it be for work or pleasure, you’ll be familiar with the challenge of trying to pack a regular electric toothbrush. This is probably because the rechargeable toothbrush currently standing in your bathroom was not designed specifically for travellers. Then what happens is you buy a cheap, manual toothbrush to travel with. No big deal right? Well actually, having that unclean feeling on your teeth can be incredibly off-putting, especially when meeting new people. Although you may have brushed your teeth, being used to the sonic power of an electric brush can make a manual version pale in comparison, leaving you feeling less fresh during the day. 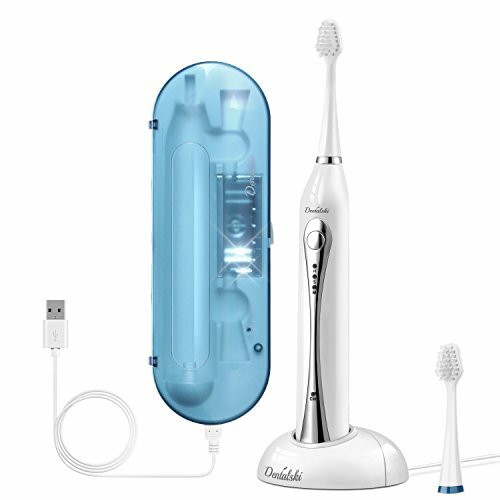 However, there are electric toothbrushes available designed specifically for travellers. They have hard, durable carry cases and are easy to fit into your travel bag while staying protected. Don’t be confused into thinking that overall an electric toothbrush does a better job than a manual brush. With the correct brushing technique, a manual brush can give you an A+ smile time and time again. The problem is that most people are lazy brushers and don’t brush their teeth correctly or for long enough. This is what leads to poor dental hygiene and even gingivitis. 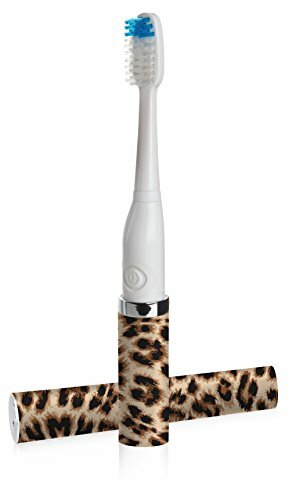 With an electric toothbrush, you tend to get a better clean because the powerful brush head is doing the work for you. Plus, many electric models include a built in timer. This means you know you have brushed your teeth for the correct amount of time rather than simply guessing. Of course, manual brushes have always been the go-to brush when it comes to travelling as they are easily portable, cheap enough to replace if lost and they don’t break easily. However, with more and more travel electric toothbrushes available, it has become even easier to get the best clean wherever you go. In terms of size, a manual and electric toothbrush tend to be around the same. However, you also often have extra heads and a charging unit with the electric versions. So you need to look for a product which is compact enough to fit into your travel pack. The best travel electric toothbrushes are very slim and can slip into the bag you always carry. Battery life is one of the most important things to think about when buying an electric toothbrush for travel purposes. If you’re planning a short trip, an extended battery life will save you a lot of space. You will be able to fully charge your toothbrush and leave the charging station at home. Also, a battery-operated slim brush is a great option as long as the batteries will last your entire trip. Ensuring your toothbrush can adapt to different voltages is something you need to consider before buying. If you plan to travel internationally, you need to use a brush that runs between 110 and 240 volts. Is a Travel Case Included? Dropping your electric toothbrush can be catastrophic. With so many small yet vital mechanisms, treating your toothbrush with care is imperative. This can be hard when travelling as often your bag is out of your hands and in the overhead compartment or luggage rack. A good quality travel electric toothbrush should be made from superior materials and include a hard case to provide protection for the product as well as storing all the accessories. There are no guarantees when travelling that you will have a socket available for charging your electric toothbrush. Offering other charging options like USB means you can charge you toothbrush via your laptop. It has to be said, this product is to toothbrushes what Ferrari is to cars. Firstly, it is brought to you by Philips, a trusted brand that automatically says ‘quality’. This toothbrush has so many features that you literally couldn’t ask for more. One of the most loved products in America, it removes 100% more plaque than a manual brush. With five cleaning modes it assures whiter teeth with seven days. The brush comes with a charging glass rather than a dock. This looks like a glass you would rinse your mouth with after brushing (and you can with this one too!) except it actually recharges your toothbrush! This means it sits nicely on your sink at home. The battery lasts three weeks with a full charge and it has a warning light to inform you when it is time to charge it. In terms of travelling, this product comes with a travel case with USB charging capabilities, plus a USB cable and wall plug. It also includes two brush heads as standard. This is by far one of the most superior products I have came across, however, there is one flaw and that is the price. This is the very top end price for toothbrushes. For me, that is very expensive. Nevertheless, this does have settings specifically for gum care which are proven to aid gum health within two weeks. Plus it is something you will use daily. Therefore, if you are someone who has had serious gum issues and are happy to make a long term investment in order to improve the health of your teeth and gums, this could be for you. Afterall, if it gives you better oral health and prevents dentistry work, then the price tag could be worth the while. Afterall, prevention is better than cure! This is another one of the best travel electric toothbrushes you can buy. This product comes with a standard charging dock for use at home as well as a UV sanitizer travel case. The battery is LI-ION and lasts for an amazing six weeks on a full charge. I have to say this is a really great asset for people who are serious travellers. It is great to know that if you are going away for a month, you can take your toothbrush without worrying about charging it. Again, it has a built in two minute timer for brushing. Another great thing about this product is it comes with four free replacement brush heads. I like this because not only does it mean a year’s worth of replacement heads for a single user, but you could also have one head for each family member in the house meaning you can all use the same brush. There aren’t really many downsides to this product at all. The only thing that some users found was that the brush is very soft and doesn’t feel as if it is cleaning as well as other models. All in all it seems like an excellent choice at a reasonable price. The only reason it wasn’t my first choice is simply because I found another slightly better. 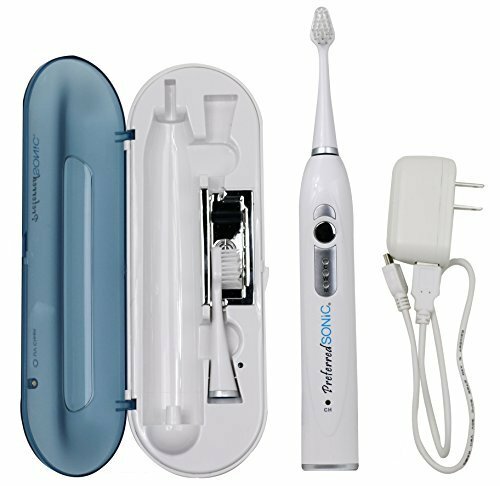 This is a rechargeable travel electric toothbrush which comes in a compact case that easily fits into a pocket or carry-on bag. It also has a two week battery life on a full charge. The brush has a automatic two minute brushing timer and a UV sanitizer case. This is SGB lab tested and proven to kill 99.9%of bacteria. It also has three brushing modes to suit most users. In terms of price, it’s middle of the road. It is not the most expensive toothbrush but not the cheapest either. One major downside of this travel electric toothbrush is that even though it has great UV technology, it does not work unless it is plugged in. This makes the two week battery life pointless since it needs to be plugged in for the UV technology to work. This is our first travel-specific electric toothbrush. This one is super slim and comes in a small leopard print case (other patterns are available). It is incredibly portable and can easily slip into your purse. It also comes at a very reasonable price. The only problem with this as it does not vibrate as much as a standard electric toothbrush. Meaning it is not the best for continuous use. This brush is solely for short term travel. 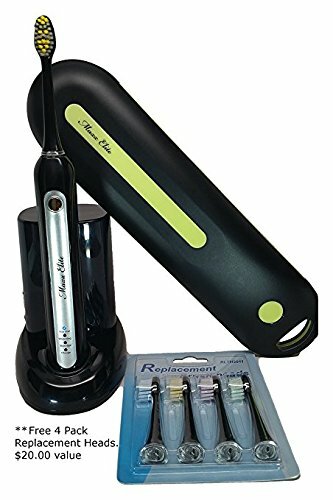 However, if you don’t want to break the bank and get an electric toothbrush for a one of vacation, this is a great option. All of these products are definitely the best travel electric toothbrushes available. All have a lot of plus points and come in at a good price meaning there is a quality product suitable for every budget. For me, the Philips toothbrush is certainly superior when it comes to electric toothbrushes generally, not just for travel use. With so many features and oral health benefits, it seems as though the rewards you get from using this brush may make the high price tag worth the while! What Is the Best Wheatgrass Juicer in 2019? What is the Best Women’s Electric Razor in 2019? What is the Best Razor for Shaving Your Head in 2019? 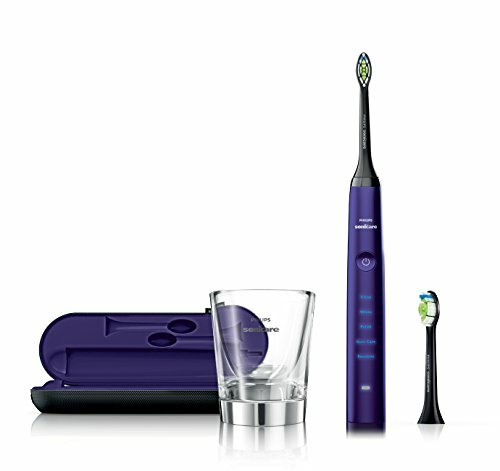 What Is the Best Electric Toothbrush for Sensitive & Receding Gums? What Are The Best Cheap Electric Toothbrushes?